Cauliflower is one of those versatile vegetables that is good for you but can easily be transformed into so many dishes. 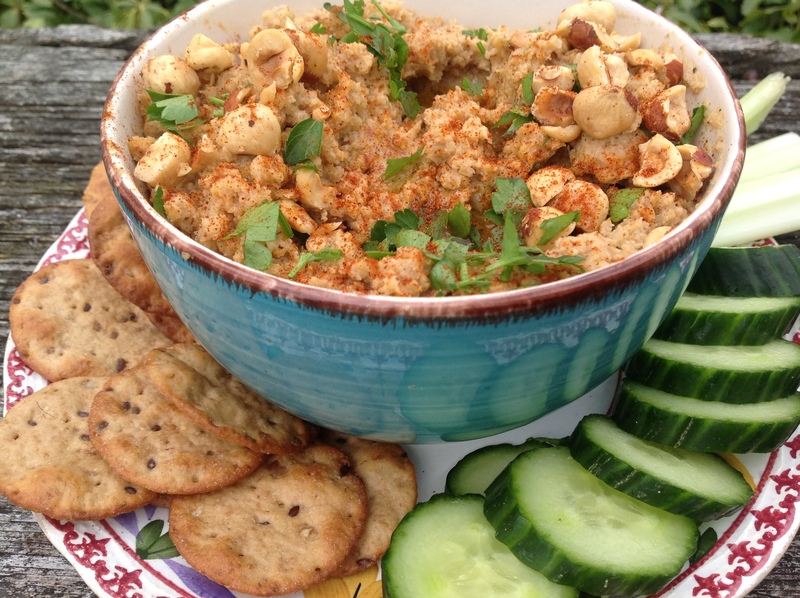 This heart-healthy dip from Cooking Canuck is hummus-like in color and texture but is made entirely of the puréed cruciferous veggie and gets a depth of flavor from caramelized shallots, smoked paprika and rosemary. Crunchy hazelnuts add protein and texture. So easy, good and guilt-free. Dig in! Coat a baking sheet with cooking spray or a bit of olive oil. 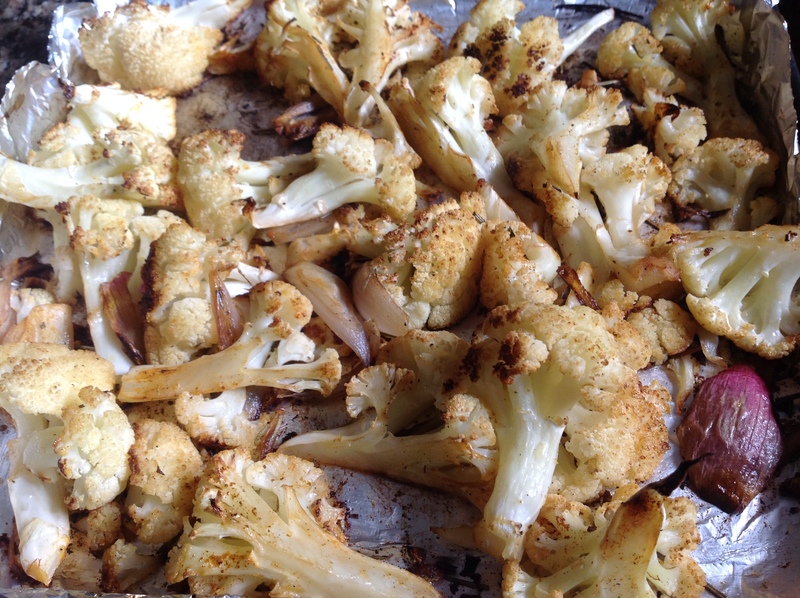 In a bowl, toss the cauliflower with the shallot, smoked paprika, rosemary and 1 tablespoon of the olive oil. Spread on your baking sheet and roast for 25 minutes on the bottom rack, stirring half way through. To toast the hazelnuts, heat them in a small saucepan over medium heat, stirring constantly until their aroma is released, a minute or two. Let the vegetables cool slightly. 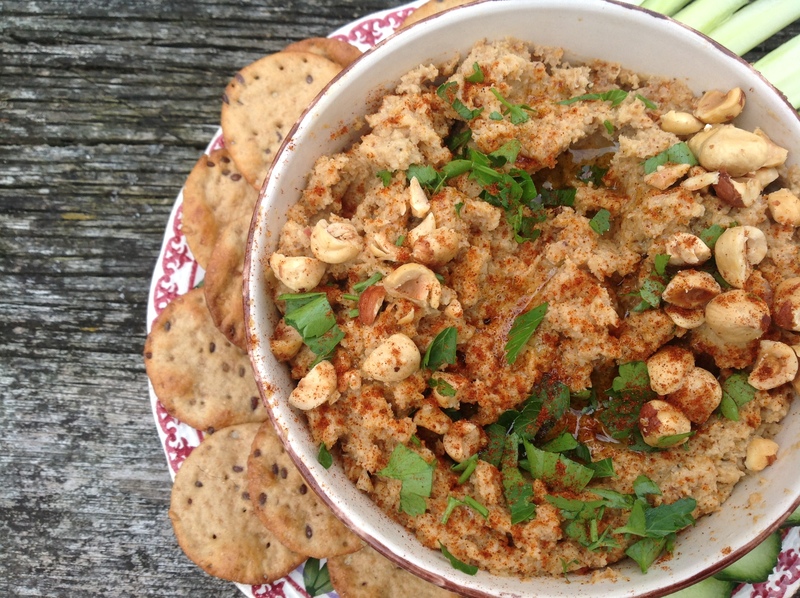 Place the cauliflower and shallot in a food processor, add the salt, pepper and 2 tablespoons of the hazelnuts. Purée until smooth, drizzling in 2 tablespoons of oil while the motor is running. The dip will be chunky but should be smooth. Taste and adjust the seasonings. I added more salt and paprika. Place in a serving bowl. Drizzle the top with a bit more olive oil and sprinkle with the remaining tablespoon of nuts, the parsley and a bit more paprika for color. Serve with pita chips and crudités for a healthy snack. For additional flavor, I drizzled the top with a black truffle oil instead of plain olive oil. 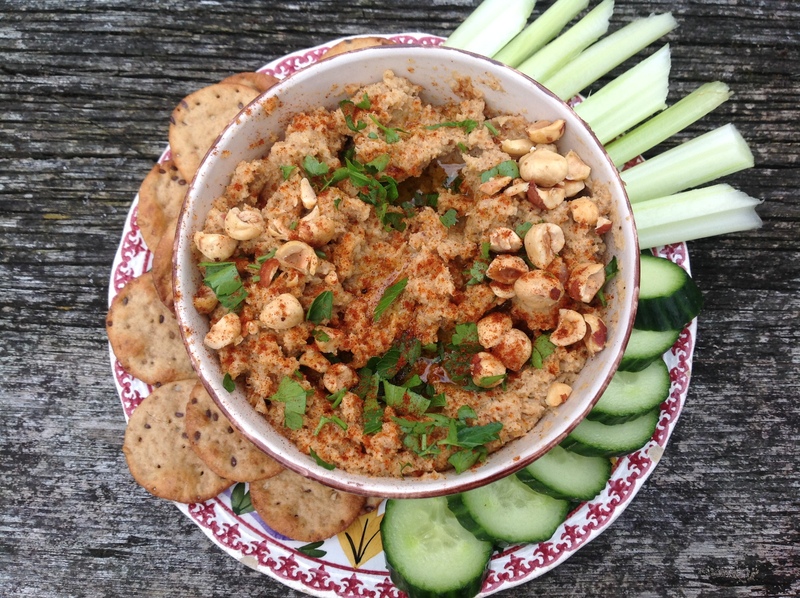 This entry was posted in Recipes and tagged roasted cauliflower and shallot dip, roasted cauliflower and shallot hummus, roasted cauliflower dip, roasted cauliflower hummus by Johanne Lamarche. Bookmark the permalink. This looks amazing Johanne. I love what roasting veggies does to a dish and I’d love to dive into this one! I’d say it is dive worthy Julie! Different and really tasty! That makes me sound like some tyrant!!!! Not at all!!!! Inspiring vegetarian cook! This will be right up my alley Johanne, love some of the spices used in this dip, the caramelized shallots, the smoky paprika and rosemary. Such delectable flavors! I’m trying …..”trying” being the operative word here, to give up carbs, so carrot sticks and celery will do real well if I were to dig into that yummy bowl. This looks very good and unique Johanne…just love it and will try this for sure. It was quite good Zeba and I hope you’ll enjoy it too! I went 30 years without eating cauliflower(the boiled bland kind). Now it’s one of my favorite veggies! Wow, I’ve seen a lot of different hummus recipes, but this one is truly unique! Perfect for spring! It is a flavorful dip and so nutritious. I hope you’ll try it Jenna! Have a good week. 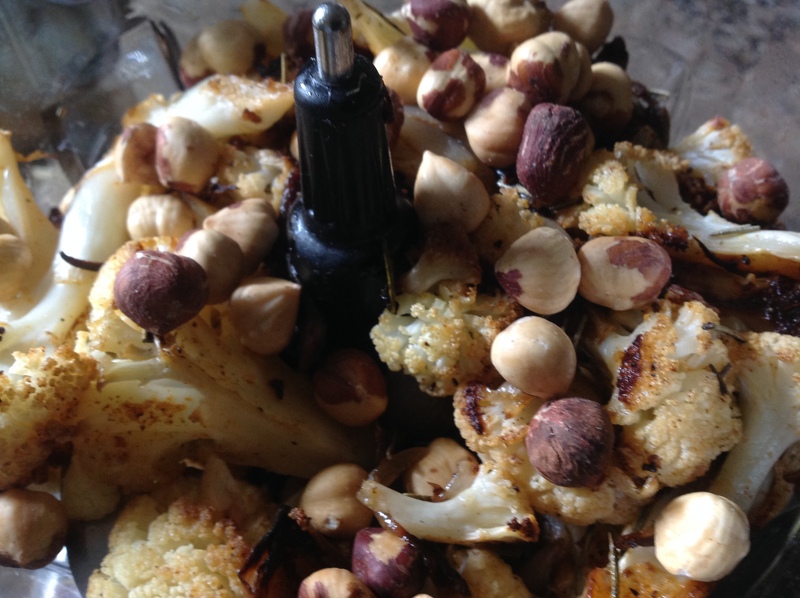 I love hazelnuts and roasted cauliflower and will have to try this recipe soon.